Ringbery app makes it easy to call from any part of world, Just need internet on phone. works with wifi or data. We support multiple payment options with PCI standard check out flows. 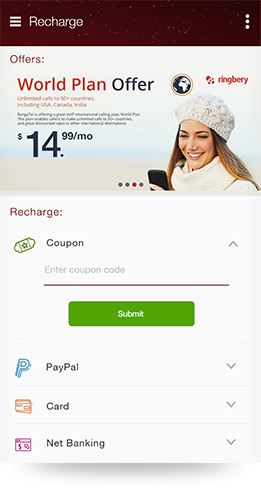 Use PayPal, Credit/Debit Cards or coupons. 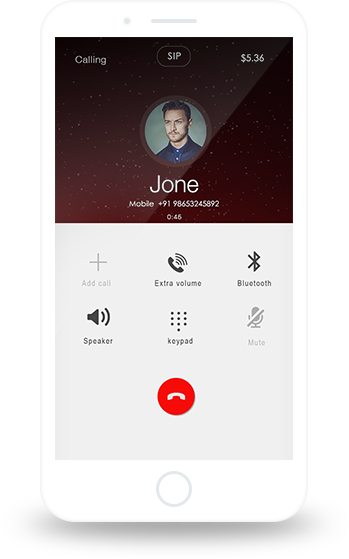 Make crystal clear voice calls with all network- 2G/3G/4G/Wi-Fi. Its uses only 8 Kbps that’s helps you make calls even in 2G networks. Allow users to make free app to app calling with end to end encryption. Freedom to chose and buy virtual numbers of many countries. Manage your incoming call to receive in App or forward to a phone number. Using efficient tunneling technology Ringbery app reduces bandwidth consumption up to 70%. Ringbery bypass firewalls through optimizing bandwidth in VoIP blocked and low badnwidth areas offering seamless VoIP calling experience for users at all times.